NEW YORK, April 10, 2017 /PRNewswire/ --Â The Empire State Building (ESB) today announced that limited tickets are now available for Easter Weekend's sunrises from atop the World's Most Famous Building. 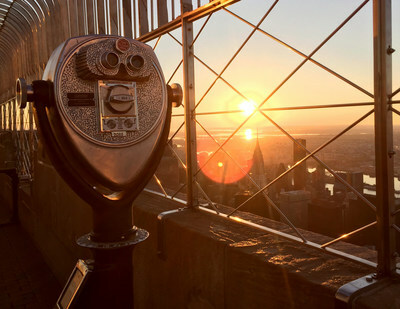 Available April 14 through April 17 and April 21 through April 24, this Easter weekend special offers visitors the opportunity to see one of the most beautiful sights in the world, the sunrise over New York City, from ESB's world-famous 86th floor Observatory. With no more than 100 tickets sold per day, guests will have the unique opportunity to access the Observatory approximately 30 minutes before sunrise and enjoy the 360-degree, unobstructed views before it is open to the general public at 8 a.m. Tickets are $100 per person and are available exclusively at www.esbnyc.com/sunrise. Reservations are required. "The response to our limited sunrise opportunities has been phenomenal.Â Our guests describe a spiritual experience, unlike anything they have ever experienced.Â We are excited to offer visitors from near and far the opportunity to see the sunrise and witness first-hand the city transition from night to day from the heart of New York City," said Jean-Yves Ghazi, Senior Vice President of the Observatory. STATE Grill and Bar, located in the lobby of ESB, will offer the "Empire State Building Sunrise Breakfast," available exclusively to visitors who wake up before dawn. Ticket holders may add a prix fixe breakfast option while purchasing Sunrise tickets. Soaring 1,454 feet above Midtown Manhattan (from base to antenna), the Empire State Building, owned by Empire State Realty Trust, Inc., is the "World's Most Famous Building." With new investments in energy efficiency, infrastructure, public areas and amenities, the Empire State Building has attracted first-rate tenants in a diverse array of industries from around the world. The skyscraper's robust broadcasting technology supports major television and FM radio stations in the New York metropolitan market. The Empire State Building was named America's favorite building in a poll conducted by the American Institute of Architects, and the Empire State Building Observatory is one of the world's most beloved attractions as the region's #1 tourist destination. For more information on the Empire State Building, please visit www.e! mpirestatebuilding.com, www.facebook.com/empirestatebuilding, @EmpireStateBldg, www.instagram.com/empirestatebldg, www.youtube.com/esbnyc or www.pinterest.com/empirestatebldg/. Empire State Realty Trust, Inc. (NYSE: ESRT), a leading real estate investment trust (REIT), owns, manages, operates, acquires and repositions office and retail properties in Manhattan and the greater New York metropolitan area, including the Empire State Building, the world's most famous building. Headquartered in New York, New York, the Company's office and retail portfolio covers 10.1 million rentable square feet, as of December 31, 2016, consisting of 9.4 million rentable square feet in 14 office properties, including nine in Manhattan, three in Fairfield County, Connecticut and two in Westchester County, New York; and approximately 706,000 rentable square feet in the retail portfolio.